I have been stand up paddling for the last 5 years traveling the world chasing waves, paddling long distance ocean channels and coastlines and racing. The sport of stand up paddling gives you such a great view of marine life as you stand on top of your board paddling through the oceans and lakes. 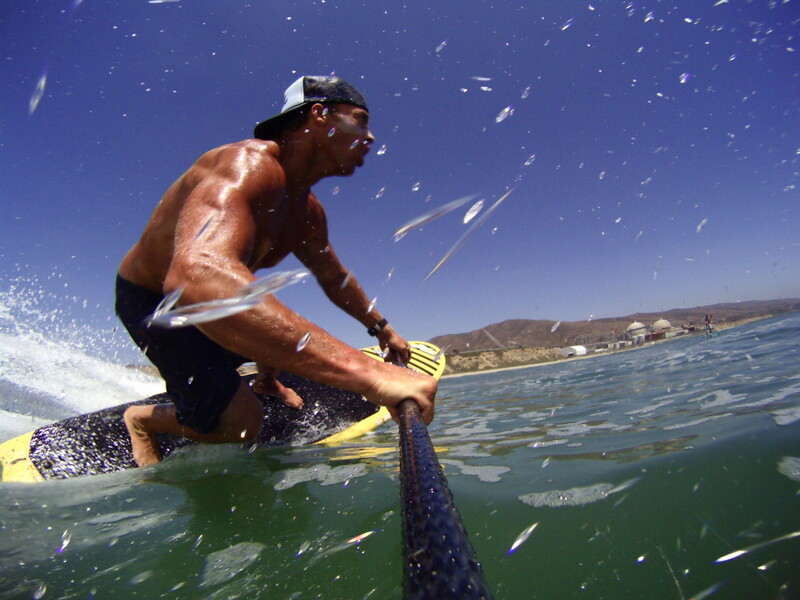 I think that is one of the most intriguing beauties that makes stand up paddling so inviting. “You are your own captain of your ship, exploring the waters of the world”. Ever since I have been stand up paddling, I have witnessed some unbelievable moments of mother Natures creations paddling in the ocean. I have had a Blue whale breech in front of me, startled a huge Marlin sunning itself on the surface, paddled along side dolphins, Grey whales, Whale sharks, Thresher and Mako sharks and in the last 2 years several Great White encounters. For someone who rarely paddles in the ocean; this could be pretty scary, but for someone like me who spends almost every day in it, It is magic. San Onofre beach has been known for hundreds of shark sightings; in my opinion because of the Power plant that sits just South of the beach park that uses the salt water for cooling and the warm water that flows back in attracts big numbers of fish and marine life and this coastline has been a known breeding ground for several sharks for over a hundred years. For the last couple of years paddling that stretch of beach, many of us have had Mako, Thresher and Great White sharks swim under and around us while SUP surfing in the line up. 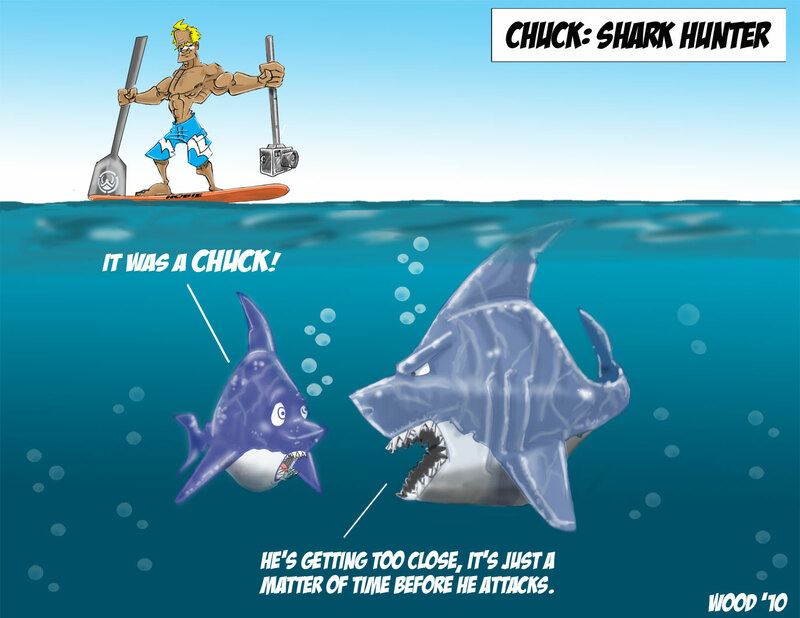 The sharks have always been there; it’s just until now because we are standing up on our boards paddling, that we have a better view of what lurks below. Most of the sharks we have seen vary from 6′ to around 10′ in length with a couple rare sightings of 12′ and bigger. With a huge abundance of fish, these sharks are fed well and have only been curious of what else shares their waters. It’s become a normal occurrence where someone has seen a shark just about every other day. The more you see them, the more comfortable you get which in turn can be a mistake, being that these kings of the sea are still very wild and unpredictable. In the past 2 years I have had some very long encounters where I have had a shark swim around me off and on for a couple hours. I would paddle around chasing down waves and like a puppy dog, it would be waiting for me just outside the surf zone. Kind of creepy, but it has always captured my own curiosity as well. It’s like being in Africa and stumbling across a lion or tiger in the bush or even fishing in Alaska and seeing a grizzly bear catching fish in the same river your fishing in. I have always wanted to take a photo of these sharks that swim along side us, but every time I took my water camera with me, I would never see one. 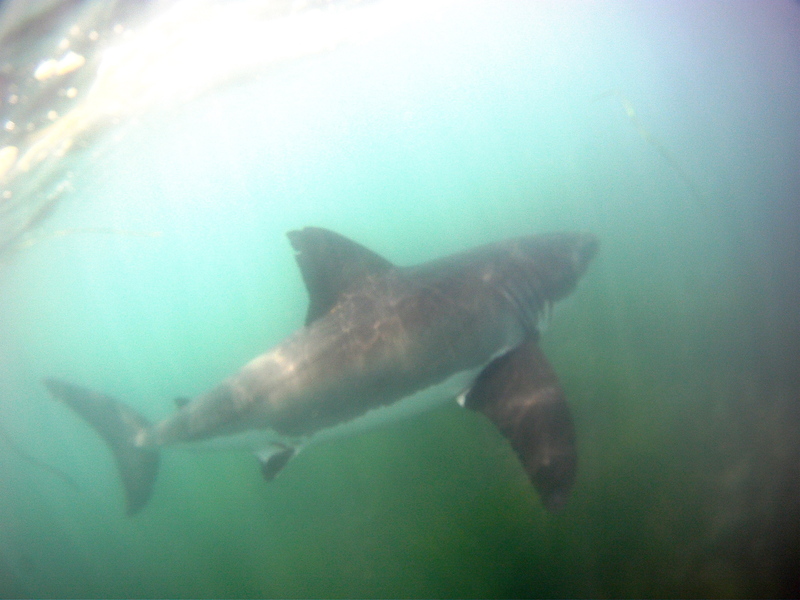 Then finally, after SUP surfing with a couple good friends one afternoon where we had a 7′-8′ shark circle us off and on for a half hour, I was determined to get a photo the next day. I rigged up an extension pole with one of the new GoPro HD HERO water proof cameras and paddled out on my 12’6 Hobie SUP race board to the same spot we saw the shark the day before and within 5 minutes there he was. Pretty unbelievable to see in person. It was a little freaky because I was looking forward and as I was scanning the horizon I accidentally startled the shark which was just behind me and as it took off, it’s tail hit my board bringing me to my knees to keep myself from falling in the water. After a moment of confusion and clarity; I stood up and set up my camera rig to take photos. A couple minutes passed and shark was no where to be seen. I had blown my only opportunity to capture a rare moment and then he appeared about 4o feet off the nose of my board. I’m not quite sure if this was the same shark or a smaller one. 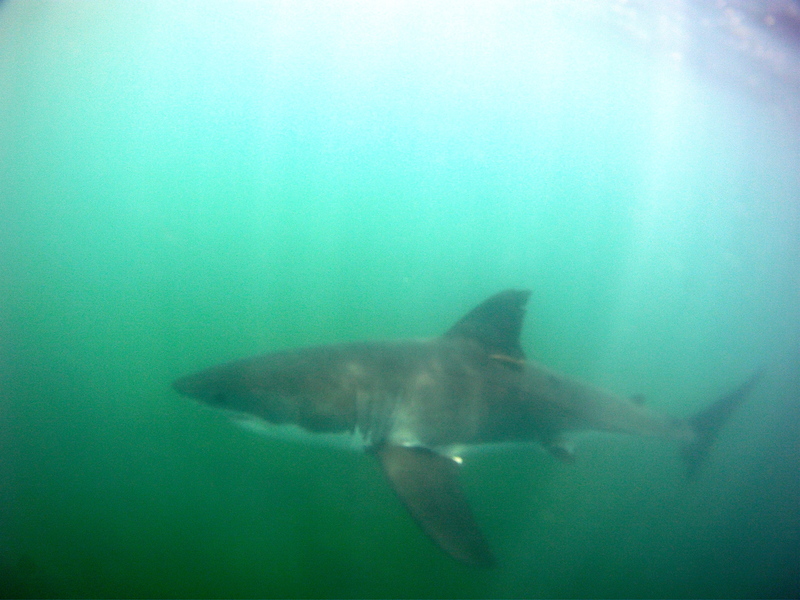 He made a couple wide passes and then came pretty close to where I could follow him swimming past with the pole cam. I shot a couple shots and then changed the setting to Video mode and was lucky to capture a couple really cool clips of him circling before taking off. I paddled around searching for him and caught a couple more waves and paddled in. Finally, I had some photos and video that I could study and share with friends. When I got home that night, my wife and I went over the photos and video and were blown away at what we saw. 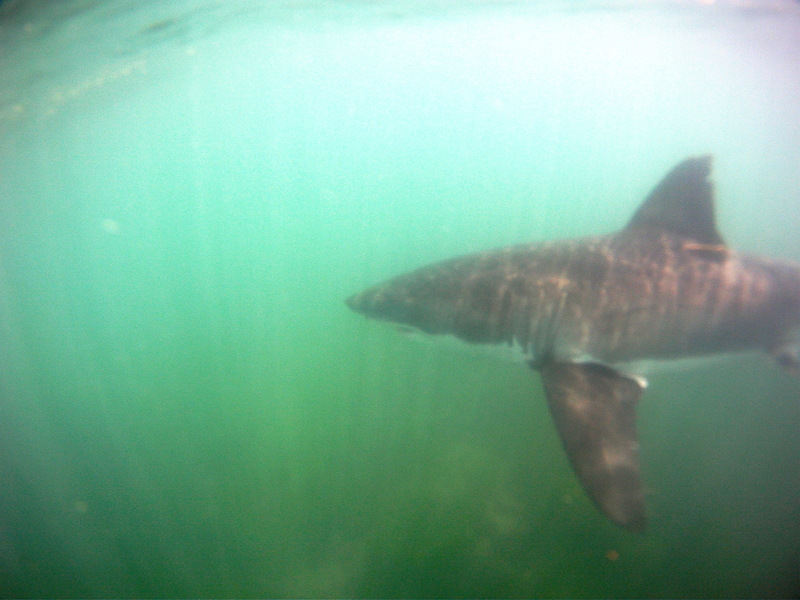 It was a 7′-8′ juvenile Great White shark that looked pretty Gurthy around his mid section. Totally stoked on my find, I put my video on Vimeo and posted it along with a couple photos on my Face Book to share with my friends. To my surprise; the next morning I was bombarded by phone calls and emails about the video. I had no idea that this was so out of the ordinary because we see these sharks almost every day. I was completely shocked at the mayhem that ensued shortly after. The shark video went viral world wide and by the next day had over 1.2 million views. I was contacted by several Shark specialists and marine biologists along with the whole alphabet of world wide news like CNN, CBS, NBC, ABC, FOX, you name it. Long story short it has been a major learning experience for me with a lot of good and also some frustration. While most of the world seemed totally shark crazed and happy there were the few who didn’t approve. My mother and sister was one of them who made me realize that yes I was very lucky to come away from that experience alive and that perusing the shark is not a good idea. I also got an ear full from the local surf schools that were losing business because the parents saw the video and did not want to send their kids back in the water. I totally understand their frustration but can’t take the blame for filming something that has been going on for over 50 years. It’s basically what I call ” out of sight, out of mind mentality “. The video went world wide because everyone shared it and it turned into a whole new animal. That being said, I have learned a great deal on how precious life is, our curiosity can, down the line get us into trouble, with every action there is a reaction, listen to your elders, and if your passionate about nature and life itself; be grateful and share it with everyone. Words of wisdom – I was lucky and the next person may not be. Leave the shark exploring to the experts and divers of the world and Shark Week. Respect and protect nature and it’s surroundings from a safe distance and keep the ocean and our world clean. Thanks for listening to another one of my eye opening adventures.